Green beans are a vegetable. They are the fruit of cultivars of the common bean, Phaseolus vulgaris. 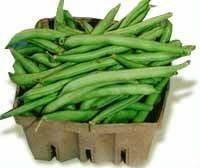 Green beans are sold fresh, frozen or canned. Green beans are cooked by steaming, boiling, stir frying, deep frying, or in casseroles. In the United States, they are sometimes served in casserole with mushrooms, fried onions and cream. In Chinese cuisine, they are often stir-fried with garlic and douchi (fermented black soybeans). In Japanese cuisine, they are served as tempura. Green beans contain lectins. That makes them harmful if a person eats too many raw or improperly cooked ones. This page was last changed on 22 January 2017, at 18:24.